Henry Ellsworth Parker, 90, the former state treasurer of Connecticut, died on September 29, 2018 in New Haven, Connecticut. Parker was elected state treasurer in 1974, on the Democratic ticket that saw Ella T. Grasso gain office as the state’s first female governor. As Connecticut treasurer, Parker was sole fiduciary of the state’s $3.8 billion pension fund, and served as Bond Commissioner, Bank Commissioner and a member of the Financial Advisory Board. His charismatic personality, grace, eloquence and sartorial elegance quickly became a hallmark of his visionary leadership and expanding national influence in the financial services arena. Among his many achievements as treasurer was the creation of Yankee Mac, a $450 million home mortgage program helping the urban centers, and his chairmanship of the Governor’s Task Force on South Africa, a body that produced for Connecticut model anti-apartheid legislation, the first in the nation. He counted as his greatest achievement his 1977 chairmanship of the State Citizen’s Committee that resulted in Dr. Martin Luther King Jr.’s birthday becoming a state holiday seven years before it became a national holiday. Governor Grasso signed it into law in 1976. In 1986, Hank joined Atalanta Sosnoff Capital Corporation in New York. He retired from the financial services industry in 1997. 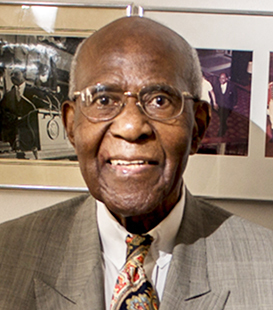 Prior to winning statewide office in Connecticut, from 1966 to 1969 Parker served as chairman of New Haven’s newly formed Black Coalition, a civic organization that would address a variety of problems inhibiting African American progress. In 1969, Parker was asked to run for mayor of New Haven and to chair the Democratic Alliance. He received 36% of the vote, won ten wards, and seven Democratic aldermen—dubbed “the Magnificent Seven,” were elected. He ran again in 1971 and received 42% of the vote and ten wards. Henry E. Parker was born to Daisy and Henry L. Parker in Baltimore, Maryland, on February 14, 1928. The eldest of six children, Parker often reflected that he and his siblings were children of the Great Depression and World War II, reared against a painful backdrop of racial discrimination, abject poverty and flagrant injustice. Throughout his youth, Parker was a high achiever. Legendary sportswriter Sam Lacy regularly reported in the Baltimore Afro-American newspaper on Hank’s athletic prowess in football and basketball at the famed Frederick Douglass High School. He was an honor student, captain of the football and basketball teams, president of the student council, and winner of the H. S. McCard Medal for declamation. Upon graduating in 1946, Hank was awarded a scholarship to the historically Black institution, Lincoln University, in Pennsylvania. After funding fell through, Parker was drafted into the U.S. Army. He became a starring center for his unit’s basketball team. After discharge from the army, Parker declined an offer to play for the Harlem Globetrotters; instead, he attended Hampton Institute from which he graduated in 1956. In 1959 he married Janette (Jan) Johnson of Poughkeepsie, New York. They moved to New Haven, where Parker became the Program Director of the Winchester Community School, and Jan organized Mother Goose Nursery and Kindergarten. Hank was an avid golfer and enjoyed playing with his friends in Connecticut during the summer, spring, and fall and enjoyed the Palm Coast in the winter. He will be remembered by many as a kind and generous person who strove to be the best in all his endeavors and left a significant mark on the lives he touched in so many ways. His parents, son, Curtis Hasan; three sisters, Thelma Parker Wiley, Bettye Parker Ford, Florence Parker Monroe, and brother, Jerome Parker, precede him in death. In addition to his wife Janette (Jan) and his daughter Janet, he leaves to mourn sister, Peggy Parker Ammons; his grandson Troy Brown, a great grandson, Daniel Brown and mother Janice Long; nephew, Frank Wiley; nieces, Lisa Monroe, Susan Monroe, Jodi Ammons Johnson and Riley Johnson. He is also mourned by the Johnson family of Poughkeepsie, NY; and a host of friends. A celebration of Mr. Parker’s life and legacy will be held Friday, October 5, 2018, at 11:00 a.m. at Dixwell Ave. Congregational United Church of Christ, 217 Dixwell Ave., New Haven. Viewing and visitation will be held at the church from 10:00 a.m.-11:00 a.m. Burial will be in Beaverdale Memorial Park. Calling hours will be held at the church Thursday, from 5:00 p.m.-7:00 p.m. In lieu of flowers, please forward charitable contributions to the Henry E. Parker Educational Scholarship Fund, c/o Martyn Philpot, Jr., LLC, 409 Orange Street, New Haven, CT, 06511. To the Parker family – We extend our deepest sympathies and condolences. We pray that God’s grace will comfort and guide you during this very difficult time. It is with sadness to hear of the passing of Hank he was a great mentor to me and so many other. I will always remember the many battles we fought together in changing the State of Connecticut for the betterment for Our People. Rest in Peace My Brother and Mentor. Jan, my Deepest Sympathy to you and your family. Cherish the memories that the two of you shared. Nothing can take that from you, for it lives in your heart and your memories. My sincerest condolences are extended to each of your during your period of bereavement. Blessings to each of you as you celebrate Mr. Parker’s extraordinary life achievements and wonderful personal character. You are in our hearts and prayers during this difficult time. We miss your kindness, leadership and smile. The Community has lost a man of distinguished humanity through us, they live on. Sharing in your loss with prayers, love and friendship. Our condolences to you and your family on the passing of your beloved Hank. So sorry to hear of Mr. Parker’s passing. I will pray for the repose of the soul of your wonderful husband and father and for God’s help for you during this sorrowful time. I will forever be grateful to your family for employment during my college years ‘Miss Jackie’ and for the glowing reference Mr. Parker wrote for me upon my graduation. Hank was trailblazer and role model. He was a man that most of those who stand on his shoulders should be attempting to emulate. His continual challenge of the the political system was indeed inspirational. For those who know their history, he will be missed. We are sending condolences to you in the passing of your husband, and keeping you in our thoughts and prayers. The lord now has Hank at his side as you have enjoyed and as Hank enjoyed being by your side for life’s journey of love. One of the true beauties of life is to have a lifelong partnership. As I think today of Hank, as you know I often did, I know the positive impact he had on others for generations will be his and your enduring legacy. Most men ‘s name will only last a generation by those who know them first hand. Future leaders will cite Hank’s extraordinary career, his professional record of accomplishments and more importantly their choice of political and financial careers based on the pathway that Hank has blazed and pioneeered with you by his side just as other great men and women work endures and becomes the history of legends not through words alone but through deeds. and accomplishments.. I am saddened to hear about the loss of Mr. Parker. I recall the days when my youngest brother, Anthony Hopkins (RIP/pre-Howard University days) would venture around the Wooster Square neighborhood and Farnum Courts doing voter registration. We were so happy to assist and be in the company of Mr. and Mrs. Parker and Janet, because it was always an extremely pleasant encounter. My heart sincerely goes out to both of you and your extended family. Mr. Parker was a “GIANT” and a force to be reckoned with that was full of love for family and his community. My thoughts and prayers are with you and the family always. Peace and Blessings Always!